First of all: Sorry for random thoughts and bad english. This is not my first language and I am trying to sort my thoughts on this project with this post. It know it might be a far stretch to find someone who has experience with this exact thing, but I would love to hear ideas and thoughts from you guys, even if you did not use the material or printing method before. Maybe you have a completely different idea. I am planning on a custom case for my niz plum84 for a long time now. I did think about a lot of materials and methods for creating it and was changing the design to accommodate for production process needs a long the way. But I always come back to the question: Why not 3d print it? It should be somewhat affordable. Maybe below $130. I am a programmer and I am working on an experience type of exhibition. For this project I designed and printed a piece which will be held by many people that will visit the exhibition and therefore will need to handle a lot of torture. From my research I found that nylon is one of the more resistant materials to print with, so I printed a first prototype with Polyamid SLS at i.materialize (I think it is based in the UK). It came out great. It has a somewhat smooth, but grainy surface. Not as smooth as pieces from a SLA printer I saw before, but still a nice looking finish and it feels nice in the hands. Some layer lines are visible but they are not as pronounced as with a standard FDM print. It also was not too expensive and with SLS Polyamid they offer a bigger build volume than what is available for SLA. Finally my question: Does someone have experience printing a case with this material? Did you encounter problems with shrinkage or other warping? How thick did you go with the material? How does the material affect the sound of your keyboard? And maybe some questions for everyone with 3d printing experience: What is your go-to-method for assembling multiple parts? Screws? Magnets? Clips that are included in the printed part? I mainly use screws and if I can, heated inserts to increase the strength. Thanks for the reply. What are heated inserts? And do you design the Thread for the screws? Just slightly tighter holes and let the screw bite into it? I love @keyboardbelle‘s board designs. Do you know what Material he prints with? And how do you assemble the parts? I’m using standard FDM with PLA. People hate on FDM layer lines, but they honestly are worth the trade-off for the lower cost and I think they have a unique look. If you approach design more like classic cars, where you want to create something that looks good in use, I think it makes more sense than obsessing over surface finishes and end-game - especially when dealing with plastic and prototypes. I think in time 3D printing layer lines will be viewed a bit like “low poly” and 8-bit and 16-bit pixellated graphics. Nylon in SLS is still a bit out of reach for home printing, I know Form Labs is releasing a printer that can do that, but it’s definitely a more expensive process and once you reach the $100 range, then CNC starts to look much more appealing. 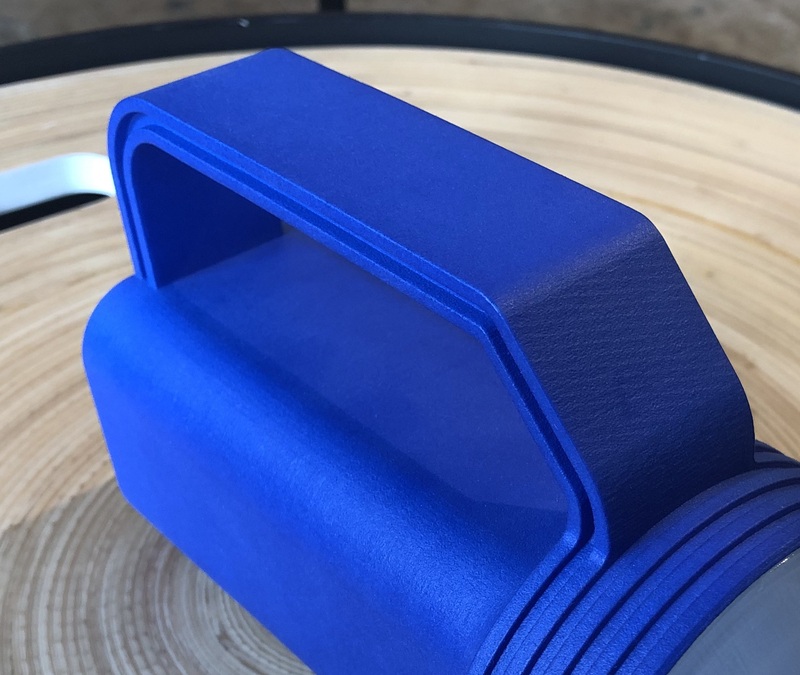 You could print FDM at 0.1mm or maybe 0.05mm layer heights and the lines would be pretty difficult to see, but you’d be in the 30 to 50 hour print range, making it much more expensive. The human eye has difficulty distinguishing below 0.04mm, so that’s the resolution where things start to appear injection molded. Another option would be to print in wood PLA filament and sand the surfaces. If you printed at 0.1mm layer heights and sanded and painted, it would be difficult to tell it was a 3D printed object. Hey, thanks for your comment and sorry for coming back to it so late. I did read it before but did not have the time to answer. I think you’re right with the fdm layer lines and in hindsight I should not have hated on them. I also think that you could incorporate the lines into the design as stylistic element. The sds nylon method would cost about 130€. But I do not have an own 3D printer and also don’t really have experience with Cnc. How would you approach a 1 piece cnc production? Just ask around at local businesses? I never heard about wood pla. Sounds great, I’ll have a look into that. My company is looking into buying a 3D printer for printing stuff we need for vr or other experiences. They want to buy a Formlabs resin printer because of the smooth surface finish. Maybe I can talk them into also buying a fdm printer. I guess it would also be good for faster and cheaper prototyping. an FDM printer is a good idea for quick prototypes, as it is SIGNIFICANTLY faster than anything a form 2 can put out. I know from experience, as the Form 2 also needs quite a bit of cleanup and prep. 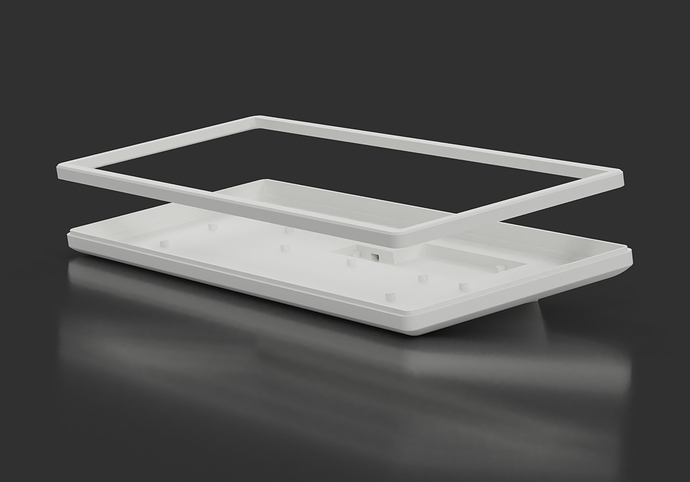 Also very interested in 3d printing a case for a 75% layout keyboard like the plum, but I am not experienced with 3d modeling software and using a 3d printer. Do you have any advice for a newbie? I saw this video by on youtube which really inspired me. Was wondering how is your project coming along? Good luck dude. I found that fusion360 is really easy to learn. I always struggled with the usual 3d model softwares, but cad software uses different approaches and seems to fit my style of thinking and working better. for example: You can change dimensions of your project at everytime, and you can come back to steps which are already done. There are a lot of tutorials for fusion360 on youtube and I found them really helpful to get started. As for the progress of my board: No progress yet, but I hope that I find time to come back to it soon. Yeah, all the best for your custom case and thanks for the recommendation. I’ve downloaded fusion360 and plan on getting to know it better.